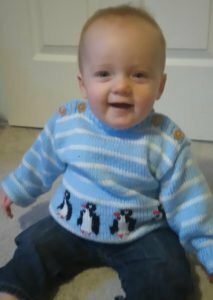 Here is a great toddlers sweater pattern. The pattern includes sizes for babies too. look, there are penguins everywhere! The sweater is boatnecked so it’s easy to get on a squirmy baby. Add the cutest buttons you can find – I used red hearts. And included is a simple striped pull on hat with a rolled brim. Perfect to add for a walk on a cool fall day. Choose any size from 6 months to 2 years. Use sportweight yarn. Of course the pattern uses minimal shaping and lots of help is included in the pattern. Not up to intarsia? 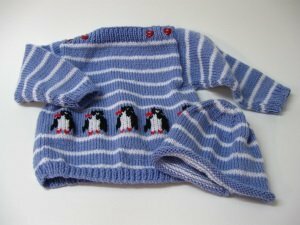 Well don’t worry, help is included for embroidering the penguins, using duplicate stitch, after the sweater has been knit. The pattern is very easy to use and includes links to helpful videos for a cable cast on, duplicate stitch and finally mattress stitch for assembling your finished sweater. And here it is on Freya (such a happy baby! Knit by my mother. Just click on the button and download a pdf for the pattern. Try it out and let us know how it goes. Just finished an Arran baby sweater for a friend at work. It’s very preppy looking with a shawl collar. Mostly, it looks really warm. Was hoping I could post a picture but I don’t see how I can here – will share another time. Happy knitting!